just going to jump right in here. 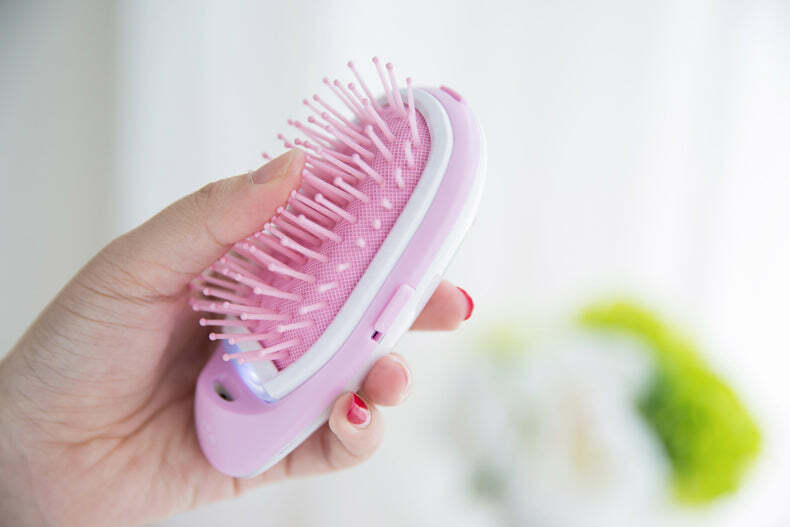 Considering the fact that I cannot find a brand for said hair brush, I should have seen this as a red flag. I was up too late on Instagram, a friend <S/O to Miss Marka!> tagged me in a post, and an impulsive shopper… other than these I have no other justification as for why I gave this bad boy a go. It’s supposed to straighten your hair and de-frizz it but it did neither and it doesn’t have a handle so it kept flying across the room and I don’t know if I’ve ever been more upset. 👉🏾It showed up almost three weeks after ordering. 👉🏼I felt personally attacked when it required a AAA battery and it was NOT included. To give you some back story… I don’t have a picture of me using it, because, well, it wasn’t worth photographing. THERE, I said it. I always told myself I wouldn’t be emotional about these reviews but here I am… ashamed and lying naked on the floor. This picture was taken from here and was the exact color I had. I feel like the questionable manicure on the hand model holding the hair brush says it all. We are both exhausted, broke, and the one time that we treat ourselves it ends up being so far on the other end of what was advertised that it makes us question ourselves (and our choices) all together.